The NCAA Tournament is set to tip off with first round games on March 21 and March 22. The top seeds in the East are Duke, Michigan State, LSU and Virginia Tech. The top seeds in the South are Virginia, Tennessee, Purdue and Kansas State. The top seeds in the West are Gonzaga, Michigan, Texas Tech and Florida State. The top seeds in the Midwest are North Carolina, Kentucky, Houston and Kansas. Five first round match ups will be examined but note that none of the top two seeds will be featured. This is mainly because an upset, while possible, is very unlikely in those games. Here are the match ups to keep an eye on. In an East regional game, 7 seed Louisville takes on the number 10 seed Minnesota. Louisville, out of the Atlantic Coast Conference finished at 20-13, but just 2-4 over their last six games. They are “ice cold down” and -0.49 on the NCAAB Team Oscillator. Minnesota, out of the Big Ten Conference, has a 21-13 mark and are 4-2 over their last six. They are “average” and +1 on the NCAAB Team Oscillator. Although Louisville is the higher seed, Minnesota has the hotter hand at the moment. 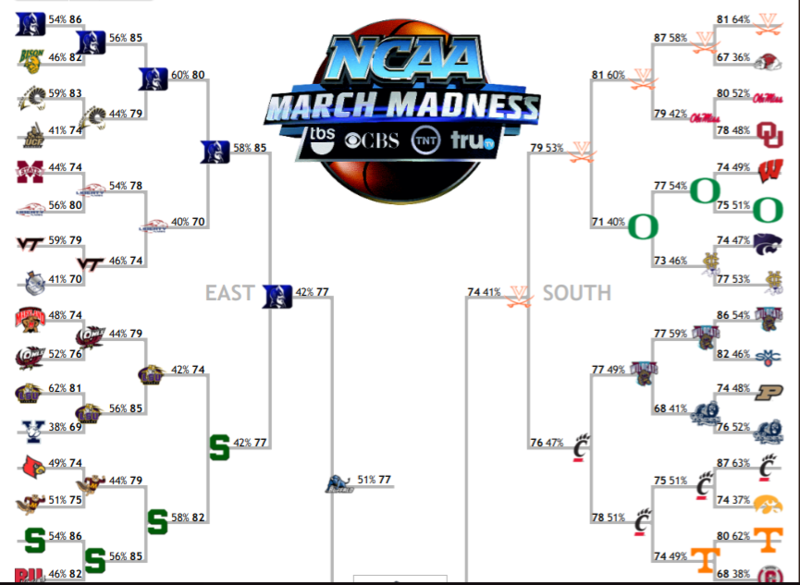 Go with a minor upset as Minnesota is the pick in a close game decided late. Washington cruised through the Big 12 Conference with a 15-3 mark and 26-8 overall. At 4-2 over their last six contests, they are “average” and +2.79. Utah State is one of the hottest teams entering the tournament, winners of their last ten. They won the Mountain West Conference and are 28-6 overall, “burning hot” and +6.42. As the number nine seed, the game is virtually a toss-up. In cases such as this, the team with the hot hand gets the nod. Utah State will extend their winning streak to 11. Marquette finished second in the Big East with an overall record of 24-9. As the number 5 seed in the West regional, they take on the number 12 seed Murray State, who finished first in the Ohio Valley conference at 27-4. Marquette is limping into the tournament having lose five of their last six. They are “dead” and +4.56. Murray State is “red hot”, winners of their last 11 and +3.96. Here’s another contest where the lower seed is playing much better lately, however facing lesser competition. Marquette is the safe bet, but it would not a surprise to see Murray State in an upset. For those who wish to gamble a bit, go for Murray State. Florida State finished fourth in the tough Atlantic Coast Conference with a record of 27-7. They enter are the 4 seed in the West Regional, taking on the 13 seed Vermont, who won the American East Conference with a 27-6 mark. Both teams have been playing very well. Florida State is 5-1 over their last six, “burning hot” and +6.78, while Vermont is 6-0 over the same stretch, “burning hot down” and -1.43. Vermont is a respectable team but they are over matched by one of the top teams in the country. The game likely will be tight for some time, however Florida State will pull away in the second half. First in the American Athletic Conference, Houston enters as number 3 seed in the Midwest Regional with a record of 31-3. They are 4-2 over their last six, “average” on the NCAAB Team Oscillator and +9.42. Their opponent is Georgia State, first in the Sunbelt Conference at 24-9. They are 5-1 over their last six, “burning hot” and +5.22. In a 3 versus 14 match up, one might expect a blowout. Not so fast in this one. Georgia State can hang with Houston and make a game of it. Houston will win, but don’t be surprised if Georgia State gives them a scare and covers the spread.